Corals at high-latitude locations in Australia, i.e., towards the south, can change their chemistry in order to adapt to colder conditions. Unfortunately, the sea is heating up not cooling down. The analysis was done by the Australian Research Centre (ARC) at the University of WA. (Australia western). A warmer ocean could be expected to slow down coral growth in Bremer Bay but the animals altered their chemical composition. Indeed, they are flourishing. It seems that growing in a cold condition is what they do best. 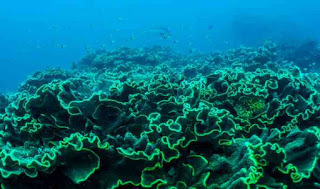 The two-year study showed that it is only tropical reefs that are under threat. There is more food available in cooler regions. By extrapolation it can be surmised that corals situated in hotter areas get less nutrition with global warming.